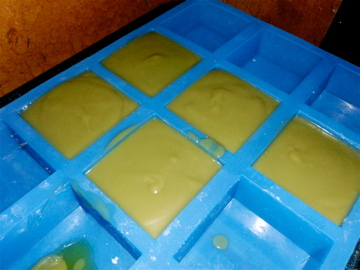 I decided to try out one more type of soap in my CP (cold process) learning. Since I am out of coconut butter I made castile soap. What is Castile soap? Castile soap is an olive oil based soap that once originated from Castile, Spain. It produces a very hard bar of soap that is extremely gentile on the skin. I wanted to make a bar that would help with acne and was gentile enough to be used on the face as well the body. To do this I used a blend of essential oils that have acne fighting properties (spearmint, tea tree, rosemary, and lemongrass) and french green clay (which is good for oily skin.) I also wanted to try to not gel this batch. Because I live in cold Wisconsin, I placed my soap out in the garage. In theory if this soap works out, though I am pretty sure it did. I will have a very hard bar of soap that is gentile on the skin. It smells fantastic and has a nice sage green color. This batch will cure for 6 weeks so I can test out 1 bar and the rest will cure longer. 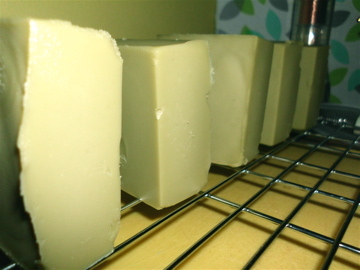 It is said Castile soap needs a longer curing time to really become wonderful. 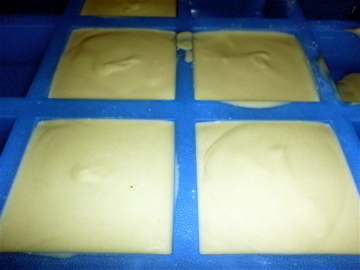 Patients is a virtue in soap making.